The proprietary PURION® Process safely and gently separates placental tissues, cleans and reassembles layers, and then dehydrates the tissue to preserve the key elements associated with healing. The PURION® Process removes blood components while protecting the delicate scaffold of the amniotic membrane, leaving an intact extracellular matrix. The result is a durable graft with natural barrier properties that offers clinicians a clear advantage in soft tissue applications. 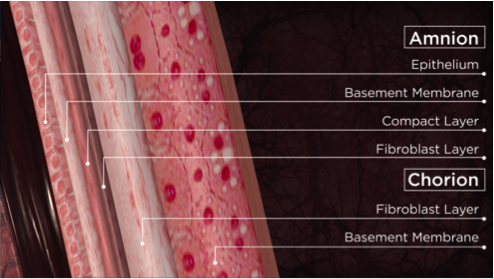 PURION® processed dehydrated human amnion/chorion allografts can be stored at ambient conditions for up to five years. The proprietary process has been specifically designed to deliver a clinically effective and minimally manipulated allograft tissue. All placental tissues are recovered under sterile conditions from patients who have been screened for underlying infectious disease. No chemicals are used in the PURION® Process that might result in chemical cross-linking or decellularization. Niknejad H; Peirovi H; Jorjani M; Ahmadiani A; Ghanavi J; Seifalian AM "Properties of the amniotic membrane for potential use in tissue engineering." Eur Cell Mater. (15). 01-JAN-2008. pp 88 - 99. Rahman I; Said DG; Maharajan VS; Dua HS "Amniotic membrane in ophthalmology: indications and limitations." Eye. (23)10. 2009. pp 1954–1961. Baradaran-Rafii A; Aghayan H; Arjmand B; and Javadi M. "Amniotic Membrane Transplantation." Iran J Ophthalmic Res. (2)1. 2007. pp 58-75. John, T. "Human amniotic membrane transplantation: Past, present, and future.." Ophthal Clin N Am. (16). 2003. pp 43-65. Adly OA; Moghazy AM; Abbas AH; Ellabban AM; Ali OS; Mohamed BA "Assessment of amniotic and polyurethane membrane dressings in the treatment of burns." Burns - 01-AUG-2010; 36(5): 703-10. Huiren Tao & Hongbin Fan "Implantation of amniotic membrane to reduce postlaminectomy epidural adhesions." Eur Spine J - 01-AUG-2009; 18(8): 1202-12. (). 2009. Arora R; Mehta D; Jain V "Amniotic membrane transplantation in acute chemical burns." Eye (Lond). (19)3. 01-MAR-2005. pp 273-8.